This past weekend I worked Movin’ On 2008 at Penn State University. On Friday morning a small crew loaded two trucks full of audio and lighting gear just south of Baltimore and took off towards State College. We arrived without issue and got to work unloading the gear and loading in for the all day show on Saturday. Compared to last year I took a ton of pictures (and put together a time lapse slide show of the event) that show some of the effort required to put on a live concert event. On Saturday morning and afternoon the weather was gorgeous. In the mid 60′s to low 70′s, there were a lot of students out on the lawn with their volleyballs and Frisbees. 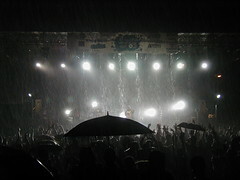 More than a half-dozen bands cycled through the main stage and the B-stage before we noticed some bad weather brewing. When it appeared on radar that the apocalypse was imminent PSU called it off temporarily in the middle of Sports DJ set; we covered all the gear with tarps best we could, lowered the stage roof, powered down, and headed inside to wait out the storm. It rained pretty heavily. Some of the tarps stayed. Some didn’t. After 90 minutes or so we headed back outside to inspect the damage. The field was soaked. The stage was relatively dry. Most of the equipment was good to go, though the moving lights were fouled up from the improper shutdown and had to be restarted manually (after lowering the roof again) during Vedera’s set on the B-stage (which sounded really good, such that I wouldn’t mind checking them out again). I was never into the Wu-Tang Clan, but apparently I’m not down with “real hip hop” since I didn’t find Raekwon‘s set to be particularly good. The crowd would disagree with me, turning out in force despite the fact that it was pouring down rain throughout the majority of the set. Automatic Loveletter was scheduled to play the B-stage, but it was completely soaked through — since electrocution would have been a certainty had we plugged anything in — and so we were making preparations to have them play on the main stage instead. We saw lightning near the end of the Raekwon set and were pretty sure that PSU was going to call the whole thing off. With a pop, everything went dark and quiet around 9:30. The generator had crapped out. Whether due to water in the exhaust or just being a crappy unit, it wasn’t running and it couldn’t be restarted. Say Anything — reportedly in from California for the show — was the headliner scheduled to close out the main stage, but to be honest I think more people showed up for the earlier Wu-Tang bit. Anyways they didn’t get to play a single note. The band may have retreated to their tour bus, but I’m not sure because we were already busy packing things up. The B-stage rig and the lighting gear had to be back in Maryland at 9:00am for another gig. The rain stopped 30 minutes into load-out, but it was still a mess getting everything out of there. The generator was still toast, so we were working entirely by 3 sets of portable utility lights (like you’d see on the side of the highway). There were plenty of muddy cables to be coiled and wet scaffolding to climb. We finished loading the trucks around midnight, around the time that we should have been shutting down had the last two acts not gotten canned by the generator failure. All in all, a good time despite the weather. This Friday I’ll be putting my time in on Art Attack at University of Maryland College Park. The lineup this year is excellent: Wyclef, Simple Plan, The Bravery, Cobra Starship, and The Spill Canvas. Looking forward to a shorter drive to the venue and some better weather. I graduated from Penn State University Park in 1973 and have only been back two or three times since. Didn’t even recognize your photo of the HUB. Sigh. Bilbo: Was it really there in ’73? … it’s looks new. No offense to you here, just props to those that maintain the facility. I mean renovations happen, but it looks really new both inside and out. I was there from 1969 to 1973. The Hetzel Union Building (HUB) was indeed there, and is where I learned to like Coke with real cherry syrup (not today’s watered-down Cherry Coke). The view of the HUB in your picture doesn’t look at all familiar; the building may well have been extensively renovated if not rebuilt…however, bear in mind that I haven’t been to the campus since sometime around 1993, when my son was an undergraduate. Memory is a fickle thing. BTW, I lived out in East Halls (Stuart Hall), and spent most of my time in the Findley Union Building (the FUB) rather than the HUB. Those were the good old days, at least when I wasn’t trying to avoid huge anti-ROTC mobs. Bilbo: My bet is that they rebuilt it, if not gutted the interior and re-bricked the exterior. 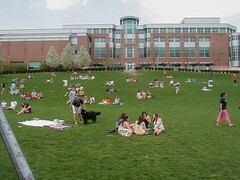 I’ve been to State College three times, twice I’ve spent a lot of time on the HUB Lawn. I haven’t seen much of the rest of the campus, but from what I’ve seen it looks gorgeous.